It’s been more than two years since my last Sea Level anomaly update using the data from the University of Colorado Sea Level Research Group . I visit their website regularly, but each update seems to be an extension of the monotonous 3.22 mm per year linear trend with another wiggle or correction that keeps it at or near that trend. That aside, since it has been two years and since there have been significant El Niño and La Niña events since then, I felt it would be good to update the Sea Level anomaly graphs at my blog. There’s another topic that prompted this post: The University of Colorado’s recently updated webpage included a discussion of how sea levels should start to rise again in response to the ebbing of La Niña conditions in the tropic Pacific, 2011_rel2: GMSL and Multivariate ENSO IndexBut the graph they included did not appear to go along with the description, so I’ve also discussed detrended sea level and the Multivariate ENSO Index (MEI) in this post. Let’s get the Sea Level update portion out of the way first. 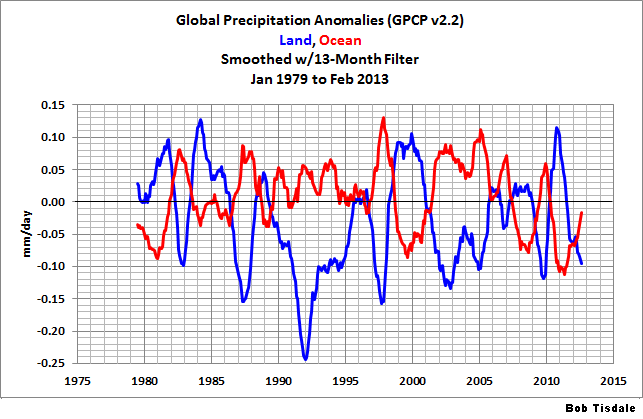 Figure 1 illustrates the global Sea Level anomalies on a monthly basis, from January 1993 to March 2011. I started with the Global Sea Level (2001 rel2) with the seasonal signal included. The data also includes Inverse Barometer and Glacial Isostatic Adjustments. I converted it to monthly data, then determined anomalies from the monthly averages of the base period, which was the entire term of the data, 1993 to 2010. And as discussed earlier and illustrated in Figure 1, the global sea level anomaly data seems simply to follow the linear trend with some minor multiyear divergences. I followed the same routine for the Atlantic, Indian, and PacificOcean data, Figures 2, 3, and 4, respectively. The Atlantic data appeared to have flattened from 2005 through 2008, but it swung back up in 2009. The Indian Ocean data is noisy, being impacted by ENSO and the phenomenon known as the Indian Ocean dipole, and it seems to be continuing its rise without any multiyear decreases in trend. The Pacific Ocean Sea Level data, however, appears to have flattened since 2006, though it does make a rise and fall in response to the 2009/10 El Niño and the 2010/11 La Niña. How long will it continue to rise at the reduced rate? And, for those interested, Figure 5 is a spaghetti graph that compares the Global Sea Level anomalies and the data for the three major basins. All have been smoothed with 12-month running-average filters to reduce the noise. Some readers prefer annual data. I’ve presented the Global, Atlantic Ocean, Indian Ocean, and Pacific Ocean data on an annual basis in Figures 6 though 9. KNMI has added the University of Colorado Global Sea Level anomaly data to its Climate Explorer on the Monthly climate indices webpage. They also have the ocean basin and sea subsets that are presently available through the University of Colorado’s Regional Sea Levelwebpage. The updating at the Climate Explorer can occasionally lag the University of Colorado, so the data at KNMI as of this writing is still 2011_rel1. But there is a wonderful benefit to using the KNMI Explorer for that sea level data: KNMI presents it on a monthly basis. Before we begin, I want to clarify two things. I am not questioning the University of Colorado’s prediction that Sea Levels will rise again shortly in response to the ebbing La Niña event in the following discussion. And I am also not implying that my findings show an error with the Sea Level data. This discussion presents a multiyear divergence between an ENSO index and the detrended Global Sea Level anomalies that I find interesting. Detrended Global Sea Level Anomalies in Figure 10 mimic the MEI data, but I don’t know that I’d call it a strong correlation. In fact, the correlation coefficient for those two datasets is only 0.44. So let’s detrend the monthly Global Sea Level anomalies, standardize the data, and compare them to the MEI data, Figure 11. (Note that the MEI is a standardized dataset, but the University of Colorado standardized it again for their graph, so I did too.) My Figure 11 is a reasonable reproduction of the University of Colorado graph, Figure 10. They presented 6-week averages of the sea level data, and I’ve presented it on a monthly basis. Now let’s smooth both datasets with a 12-month running average filter, Figure 12. The detrended and standardized Global Sea Level anomalies definitely do not always follow the ENSO index. And it doesn’t appear that any other method of scaling the two datasets will provide better results, but let’s try two more. For Figure 13, I did not standardize the detrended Global Sea Level anomalies, but I scaled the MEI data based on a linear regression analysis. That doesn’t help. All that seems to do is emphasize the differences between the two datasets, especially the two Bactrian camel-like humps in the detrended Sea Level data compared to the three moderate El Niño events between 2002 and 2007. Last, for Figure 14, let’s assume that the “Super” 1997/98 El Niño was the only ENSO event during the period that was strong enough to overcome the year-to-year noise in the Sea Level data, and that the evolution phase of that El Niño event should be “cleanest” since the decay phase in the sea level data includes the aftereffects of the El Niño. Then we can scale the MEI data and shift it down so that the leading edges of the two datasets align during the evolution of the 1997/98 El Niño. Now, note how the Detrended Global Sea Level anomalies diverge from the MEI data during the decay phase of the 1997/98 El Niño. Then they rise, remaining well above the ENSO index data through 2005, when they start to drop until they realign again during the decay phase of the 2009/10 El Niño. Interesting, isn’t it? It’s something that needs to be investigated further. Detrending the Atlantic and Indian Ocean datasets and comparing them to the MEI data that has been scaled to the response to the 1997/98 El Niño does not seem to shed any light. Refer to Figure 15 for the Atlantic Ocean data and Figure 16 for the Indian Ocean data. But the detrended Pacific Ocean data, Figure 17, has a response that’s similar to Global data, so it might hold the key. Someone is bound to ask why the detrended Pacific sea level data precedes the MEI data. Let’s replace the MEI data with scaled NINO3.4 Sea Level (not Sea Surface Temperature) Anomalies, Figure 18. The detrended Pacific Sea Level anomalies do not lead the NINO3.4 Sea Level Anomalies. Keep in mind that I used the MEI data because the University of Colorado used it, not because it was the right ENSO index to use with Sea Level data. As illustrated in Figure 19, the NINO3.4 region Sea Level anomalies precede the NINO3.4 SST anomalies and the Multivariate ENSO Index data. And they should. The NINO3.4 Sea Level data captures the Kelvin waves and the subsurface temperature anomalies traveling from west to east across the equatorial Pacific, which lead the response of the NINO3.4 Sea Surface Temperatures and many of the additional variables used in the Multivariate ENSO Index. The answer to what causes the multiyear divergence of the detrended global sea level anomalies from the ENSO index might rest in the process of ENSO and the significant redistribution of warm waters from the tropical Pacific following the 1997/98 El Niño event. Then again, mass from glacial runoff is also a major contributor to Sea Level. Did it temporarily increase for a few years after the 1997/98 El Niño? For now, I’ll treat the decade-long divergence as a curiosity, but I’ll keep looking for an explanation. This entry was posted in Sea Level. Bookmark the permalink. seems to indicate the same type of inclines based upon ocean temp. Doesn’t temp increase explain the vast amount of change in sea level? Pascvaks: According to the IPCC’s AR4 Chapter 5 Table 5.3, thermal expansion is a little more than 50% of the rise between 1993 and 2003. Thank you once again. I better quit with the early 60’s high school questions, I think I’ve forgotten more than I ever knew. It’s been a while. You’re very kind. For comparisation the SSH time-series with another one sometimes the Colorado series is too short. So I found this one http://www.cmar.csiro.au/sealevel/sl_data_cmar.html ( Church & White 2011). I used the data from 1950…2009 and matched the latest data (Colorado). So tried to find a “short link” to MEI… also with no luck. Anyway, there is a good agreement to OHC, I deterended both series and found this: http://www.dh7fb.de/reko/ssh/image001.gif . After calculating the residues between both series you get this picture after also plotting the Nino 3,4 : http://www.dh7fb.de/reko/ssh/image002.gif . It could be, that in first degree the SSH is a result of the OHC and only after removing this dependency we can see the influence of ENSO . Interested in what you think of this research BOB. At first glance the conclusions seem weird..
“For an 18-month period beginning in 2010, the oceans mysteriously dropped by about 7 millimetres, more than offsetting the annual rise,” the US National Science Foundation said in a statement before the release of a report to be published next month in the Geophysical Research Letters journal. The US researchers said Australia’s unique topography and the lack of river run-off west of the Great Dividing Range were key to the impact on global sea levels. Since 2011, sea-level rises have picked up again, surging at a rate as fast as 10 millimetres a year, the peer-reviewed US report found.